Bet Ravens +4.5 over Chargers with 888Sport. Bet Titans -10 over Redskins with Karamba. Bet Lions +6 over Vikings with Betfair. Bet Dolphins -4 over Jaguars with 888Sport. It was a 2-2 kind of a week for us as the Oakland Raiders and Jacksonville Jaguars just never showed up for us. Meanwhile, the Houston Texans and Indianapolis Colts helped us even things out. Let’s take a look at Week 16 and see what we can find in terms of winners for all you fans of NFL betting. The Ravens and Chargers are both hot right now. They have both won four of their last five games and they’ve both played well in Kansas City against the Chiefs in recent weeks. While three wins separate the two sides in the standings, there really isn’t much between the sides. 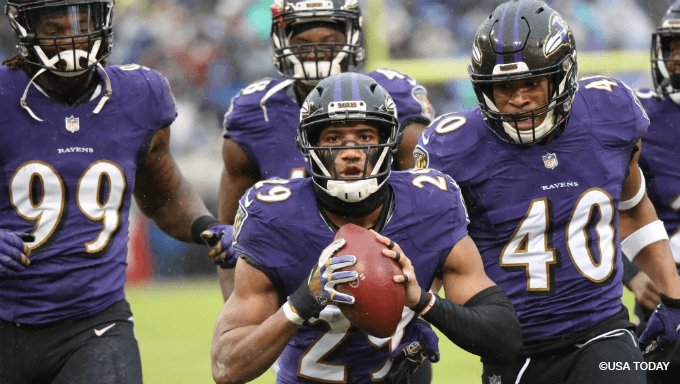 The Ravens blew late-game opportunities versus New Orleans and Kansas City, while the Chargers pulled out late-game wins versus Pittsburgh and Kansas City. I’ll take a shot with the Ravens plus the points with 888Sport , as their ball control offense has worked quite well. Their defense might be the best that the Chargers have seen all season. On top of that, the Chargers are just a little banged up at a couple of key positions with running backs Melvin Gordon and Austin Ekeler, who aren’t quite 100 percent, and wideout Keenan Allen left last week’s game with a hip injury. Both teams in this game are in the playoff hunt and both with no realistic chance of winning a division. They will have to get a wild-card berth if they make the playoffs. This is a game in which motivation, as an intangible factor and a basis for picking one team over the other, is a wash. No team has an advantage there. This is about the matchup and the quality of the teams. The Titans clearly deserve to be seen as the heavy betting favorite in this game. They just shut out the New York Giants on the road. A week earlier, the Giants took at 34-0 halftime lead over the Redskins in Washington. That should be enough to convince you that Tennessee should win this game big over the Redskins, especially playing at home. To add to the point even more, realize that Washington probably drew the perfect opponent this past week: a Jaguars team that played Cody Kessler at quarterback and were absolutely awful on offense. That was the perfect tonic for the Redskins, who – with Josh Johnson at quarterback – did just enough. The Redskins finished the day with just 245 yards of total offense. They won’t win back-to-back weeks on the road playing like that. These two teams are 7-7 but they’re very different. The Redskins are banged up all over the place. The Titans are healthy, at home and are playing well right now. Bet the Titans -10 with Karamba. The Vikings are 2-4-1 on the road this season. Their most recent road game was a total disaster in which they very nearly got shut out by the Seattle Seahawks before scoring a touchdown inside the final two minutes when trailing 21-0. The Vikings fired their offensive coordinator after the Seattle loss and responded well against the Miami Dolphins, but that game was at home. This is a divisional road game, and the Vikings are 0-1-1 in divisional road games this season. The Lions, on the other hand, are 1-1 in divisional home games and were tied at 16 with the Chicago Bears before throwing a late pick-six on Thanksgiving. Minnesota might win outright, but relative to the spread, the Lions are receiving a healthy chunk of points, and that is hard to go against. Kirk Cousins does not deserve this much benefit of the doubt as the Vikings’ quarterback in a road-game situation. The Vikings are just 10-20 ATS in their last 30 games where they’re a road favorite of 3.5 to 7 points. Take the Lions +6 with Betfair. The Jaguars’ total stink bomb – only six points scored on offense (seven on special teams) – against the undermanned Washington Redskins at home this past Sunday really tells you all you need to know about the state of Jacksonville right now. On top of that, you have a huge difference in home-away splits between the teams. The Dolphins are 6-1 at home and just 1-6 on the road. Meanwhile, the Jaguars are 3-5 at home compared to 1-5 on the road. They’re losing by over 15 points per game on the road compared to 5.8 at home as their defense allows nearly two touchdowns per game more in away contests (27.4 on the road compared to 13.9 at home). Take the Dolphins -4 with 888Sport.